Election 2012: How do debate performance and post-debate spin impact projections? The election is 26 days away and both candidates are campaigning in full-force, emphasizing on swing states where some claim it’s still anyone’s game (see current projections here). 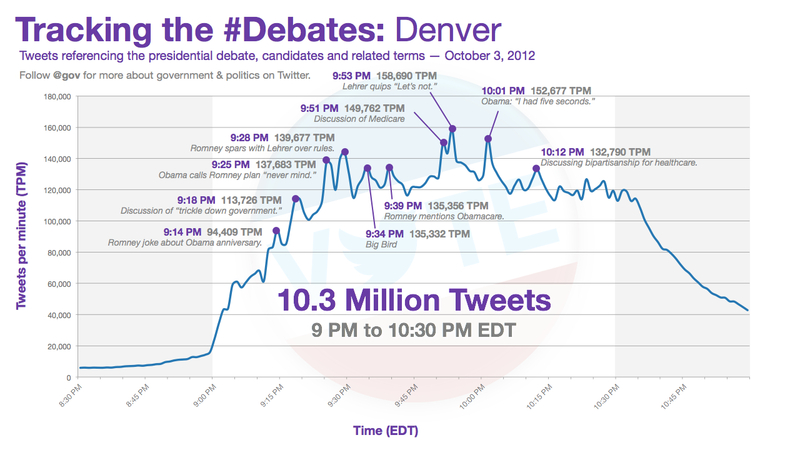 The initial Presidential debate took place Tuesday, October 3rddrawing a crowd of 58 million viewers and breaking all records on Twitter receiving 10.3 million tweets in the 90-minute timeframe (illustrated in an infographic here). Prior to Tuesday’s debate, many analysts projected the President had a 71 percent chance of victory with Romney having a 24 percent chance of unseating the incumbent. Post-debate polls revealed Obama’s odds plummeted eight percentage points while Romney’s chances increased to 32 percent. During the debate, the President appeared apathetic at times and annoyed at having to defend reasoning behind his policies. The Obama of the 2008 campaign, filled with fervor for debate and a “Yes WE can!” attitude, is surely not the man who appeared in Denver. Post-debate reports criticized Obama to the point of saying, “He doesn’t seem to mind the prospect of being a one-term president.” Obama’s responses seemed weak and he didn’t offer any epiphany on new strategy, rather gave a “stay the course” message when most Americans realize his budget has been rejected by Congress. Romney on the other hand, made great and somewhat unexpected strides in public perception. Unlike past public appearances and speeches, Romney was practiced and well-messaged. He set-forth a clear action plan and offered tactics for implementation while poking holes in, what conservatives claim is the President’s failing record. This marks the first time most citizens, journalists and politicos have described Romney as Presidential. These are the realities of the debate; however, what is often more important than realities is post-debate performance spin as it is these catchy messages most Americans remember. The President’s top advisor, David Axelrod, said Romney’s debate performance was very good theatrics and failed to provide details for his plans and proposal to fulfill campaign promises. While Ed Gillespie, Romney’s senior advisor, retorted the former governor did provide substantial detail and offered “a very fact-based critique” of current Obama policies. Seeking to capitalize on these critiques, both camps released ads and videos the day following the debate. Romney’s team released a nearly two-minute video. It uses scenes of main-street America cut with excerpts of Romney’s debate dialogue set against a symphonic melody. All of these tactics strategically employed to evoke emotion. The Obama team released a 30-second ad cutting Romney’s debate comments with top-level media criticisms claiming Romney isn’t trustworthy or answering the tough questions. Two Presidential debates and one Vice Presidential debate remain. This is a paramount time for both parties as the world is tuned in to the issues as well as appearances and attitudes of both candidates. We can expect Romney and Obama to step-up their game and increase spin. The American people have made it clear they are looking for progress in the economy, healthcare, jobs and the national deficit. In order to win this election, the candidates will need to satisfactorily answer tough policy questions and set-forth clear steps to attaining progress.